From patient appointment text reminders to medication alerts, use two-way SMS text and voice to connect with your patients where they are. Automated SMS Reminders: We use SMS text to communicate with patients because 98% of text messages are read. Reminding patients of appointments ensures they show up for scheduled visits or gives you the opportunity to fill cancelled timeslots. Automated Voice Reminders: For patients who prefer phone calls, we offer automated outbound calling to remind patients of scheduled appointments. This minimizes the amount of time your office staff spends calling patients manually. HIPAA Compliance: We take safeguarding patient information seriously. Our solutions are fully HIPAA compliant. Two-Way Integration: We seamlessly integrate with your EMR or practice management system for a frictionless connection with your existing workflow. Multi-Channel Options: We offer text, voice, and email to can reach your patients however they want to be reached, whenever you want to reach them. And, because we can distinguish landlines from mobile numbers, we can help customize based on your patients’ preferences. Customizable Details: We start by establishing communication protocols based on industry best practices. Then, you have complete control over the type of reminder you send, from voice and email to text, and when you want to send it, whether it’s 4 hours or two days before an appointment. 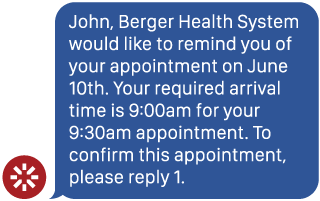 You can also customize messaging for any appointment type, provider, or office location. Predictive Dashboard: Our real-time analytics allow you to monitor no-show rates and predict those at risk for skipping their appointment. Use predictive overbooking to double-book appointments for high-risk no-show patients with patients more likely to show up.